Coming Soon! Peach Pass available in Spring 2011. I-85 Express Lanes in Atlanta open in Summer 2011. View the Peach Pass video to see lots of accessible math connected to a real community issue. Learn more about the I-85 Express Lanes. What’s the difference between an express lane, a toll road, and a turnpike? Are you charged by the mile or by the minute? Why is the target speed 45 miles per hour? What is the target speed for other express lanes? How will the Peach Pass know when I should pay (because I have less than 3 people in my vehicle) and when I can ride toll free? What is the mathematical model that determines the toll? We know it is positively correlated. 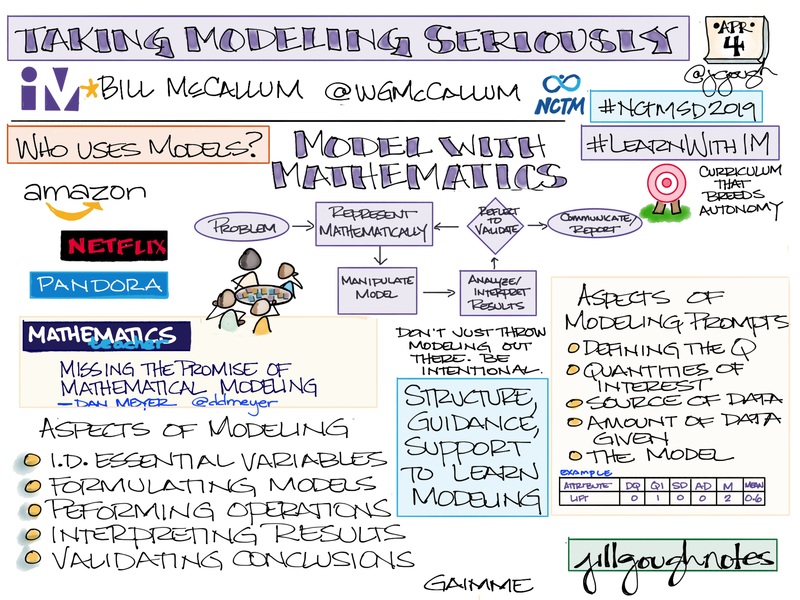 Will the model be linear, exponential, or some other type of function? What will the revenue generated by the Peach Pass be used for and who controls these monies? Are the Peach Pass and other E-ZPass-type cards cost effective or just convenient? How do the other locations listed in the video charge for the use of their express lanes? How do other states collect this money? Utah, for example, uses an ExpressPass. 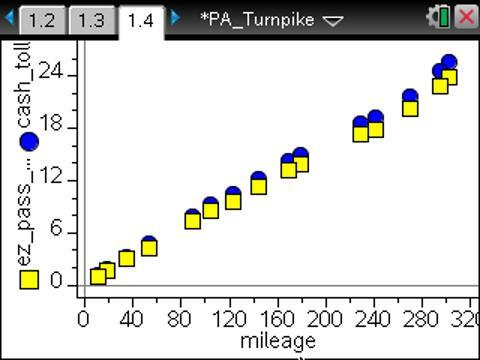 The Pennsylvania Turnpike is the oldest turnpike in our country. Beginning in January, 2011 there was a rate increase; cash tolls increased 10% while E-ZPass tolls increased by 3%. Is there a savings to use the E-ZPass, or is it just for convenience? 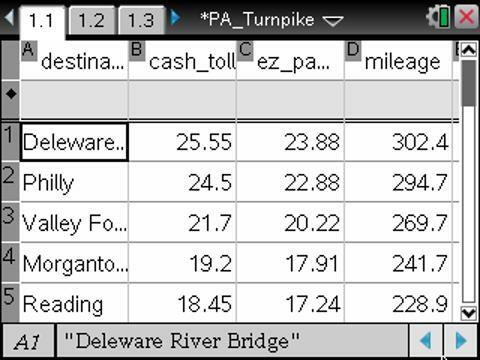 Since there is a Pennsylvania Toll/Mileage calculator, we can investigate the cost to drive on the PA turnpike. Would this help indicate a reasonable rate for driving on any toll road or express lane? 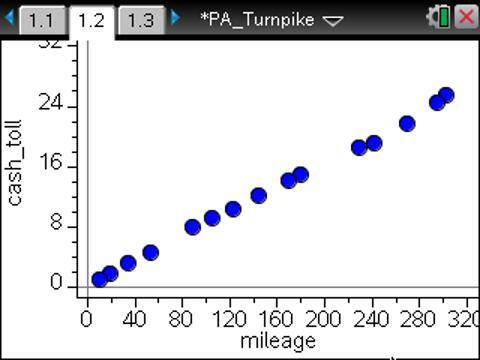 To see if there is a pattern to the cost, I chose to collect data entering the Pennsylvania Turnpike at Interchange 57-Pittsburgh and then vary the exiting interchange for a class 1 vehicle with 2 axels. I wonder what the toll rate for an 18-wheeler would be compared to my passenger vehicle. My learners have many choices. They may choose to start at any entry point on the turnpike and vary their exiting interchanges. I suppose they could vary both the enter and exit interchanges. They could also change the type of vehicle to investigate the charges and the rates for different size vehicles. Is there a pattern to the data? It the relationship linear, exponential, logistic? To see the relationship between the data, we graph. To compare the two data sets, graph on the same grid. What are the mathematical models that could represent these data sets? What are the meaning of the slopes of these lines? Is it cost efficient to purchase the E-ZPass? Is there a relationship between the E-ZPass toll charged and the Cash toll charged? What is the mathematical model that could represent these data? What is the meaning of the slope of this line? 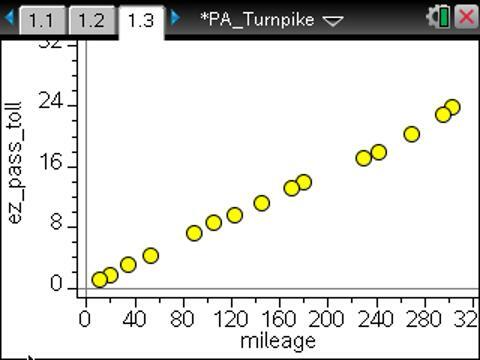 How does the rate charged by the PA Turnpike compare to the rates of other turnpikes? How does the rate charged by a turnpike compare with the charge on a toll road or express lane? From $0.60 to $6.00 is a pretty big swing in cost to use the 16 miles of the I-85 express lane in Atlanta. How will traffic volume be determined since tolls go up when traffic volume increases and the toll is lowered when traffic volume decreases? How do the toll roads, turnpikes, and express lanes in other countries compare to our toll roads, turnpikes, and express lanes? How do they compare in cost, in speed, and in access? Can our learners aquire the needed content through a problem or project based approach? Will they find the content more interesting and engaging? 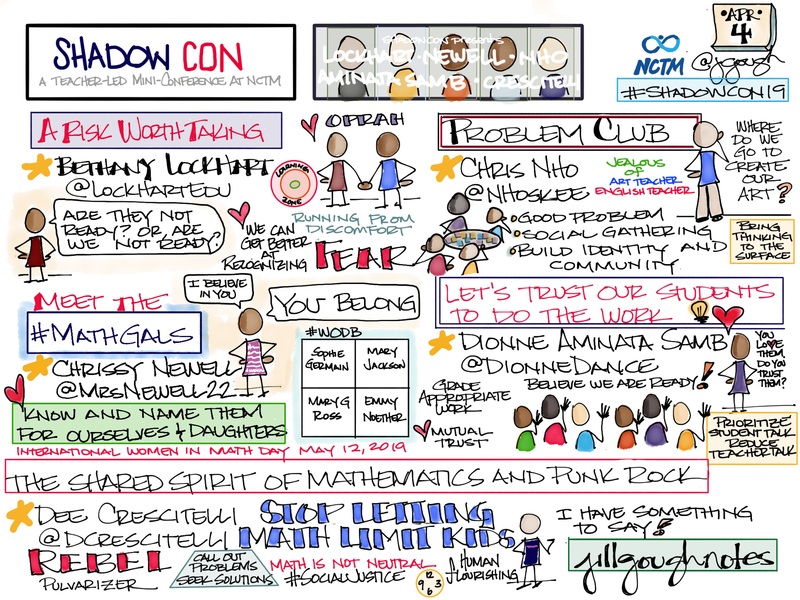 As we learn more about problem-based learning and project-based learning, would this be type of lesson help learners see the application of content? … the blending of content? … the relevance of content? I think so. Are we willing to experiment?… to learn by doing?